Traditional Luxembourg cooking combines vast portion sizes that reflect German heartiness and large appetites, with flair and flamboyance that show more Franco-Belgian finesse. The preparation of local freshwater fish, trout, pike and crayfish is almost universally excellent, as are the pastries and cakes. Delicious desserts are prepared with local liqueurs, and a dash of quetsch, mirabelle or kirsch is added to babas or fruit cups. Most aspects of restaurants and bars are similar to the rest of northern Europe. 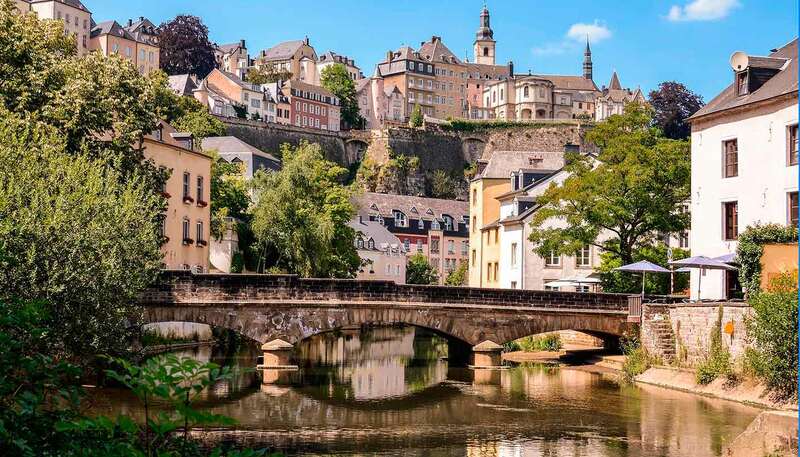 Despite their geographical proximity to the German Mosel region, Luxembourg's white Moselle wines most closely resemble those of the French Alsace region. Like the Alsace they usually feature single grape varieties, including Riesling, Pinot Blanc, Pinot Gris and Gewürztraminer. The quality is often excellent and is gaining an increasing international reputation. The white sparkling wines, mostly classified as crémants, are also of a very high standard, and frequently enjoyed as a pre-dinner aperitif. The red wines, mainly Pinot Noir, are a rarer find, but increasing in quality each year. Many small wineries that lack their own bottling facilities sell their produce via a large-scale cooperative, Domaines de Vinsmoselle, and this is the most commonly seen label in the country. Beer is another speciality and a traditional industry, but brewing traditions are not as great as in neighbouring Germany and Belgium. • Judd mat gaardebounen (smoked neck of pork served with a stew of broad beans and potatoes sautéed with bacon). • Bouchée à la reine, or paschtéitchen (chicken and mushrooms in a béchamel sauce served in a puff pastry case. Similar to a large vol-au-vent). • Cochon de lait en gelée (jellied suckling pig). • Jambon d'Ardennes (famous smoked Ardennes ham, traditionally eaten cold and served with a light salad and French Fries). • Tarte aux quetsches (quetsch plum tart). • Friture de la Moselle (small river fish, deep fried and eaten whole – similar to whitebait). • Gibier (general term for game, usually appearing on menus in autumn, particularly in the northern Ardennes region, from where the animals originate. Wild boar (sanglier) and venison (chevreuil, or biche) are both popular). Traditional Luxembourg dishes such as judd mat gaardebounen tend to be served in gargantuan portion sizes and are not for the faint-hearted. More modern restaurants however are far more French influenced, and the serving sizes are reduced accordingly to more normal levels. Many tourist restaurants in the Ardennes usually have menus based around veal (as schnitzels or with cream sauces), but this reflects the wishes of the predominantly Dutch and German guests rather than any Luxembourg traditions. Bills generally include service, but a rounded up tip is often given. • Bofferding, Simon, Battin, Ourdaller, and Diekirch (beer). • Eau de vie - 45 to 50% alcohol spirits, mostly based on local fruits, particularly plums (for example quetsch and mirabelle) or pears.